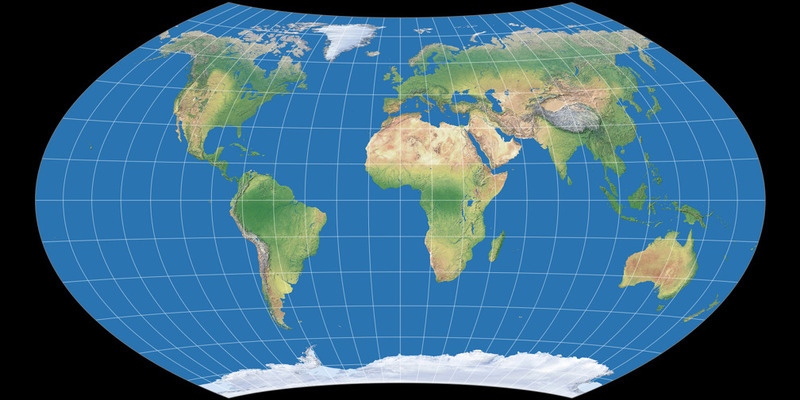 map-projections.net offers some Viewing Options that affect the display of the projection images. Here, I’m going to explain what’s it all about and why I included them. Note: The Viewing Options are not to be confused with the Mode of Comparison: Simple Mode / Expert Mode! Those modes are explained in the sort hints. By default all physical map projection images are shown having a shaded relief ocean floor. Originally, I used this images simply because I like them very much. :-) However, as time passed I realised that this imagery might not be the best to emphasize on the characteristics of the different map projections. 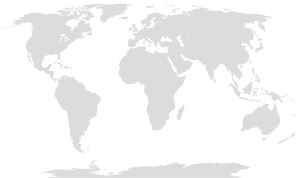 So I generated a new image set having oceans with flat blue tint and stronger graticule lines. But because I just love the shaded relief ocean floor images I couldn’t bring myself to replace the old images with the new ones. So I simply added the new images as an option. Use the Viewing Options menu in the upper right corner of this website: Check Flat Oceans box and hit Set. In the compare section you’ll see the flat ocean images then. And of course, uncheck the box and hit Set again to recvert to the shaded relief. Why are world maps always shown with North on top and South at the bottom of the map? And therefore, you sometimes might stumble across maps that have South at the top. They are called rotated maps, upside down maps or reversed maps. Or simply south-up maps which is the term I like best. Those maps are often created by people who live in the southern hemisphere because they are fed up with being at the bottom or for educational reasons, i.e. teaching the people that north-up maps are nothing but a conventional practice. If you prefer south-up maps: No problem! Just enable the South-up mode, and all projection images will be displayed upside-down. Again, just check the option in the menu above and click Set. However, this only works with web browsers that are not too outdated, for a very simple reason: South-up mode uses the very same images that are loaded for the usual north-up display, but your browser is instructed to rotate them by 180 degree. And unfortunately, old browser will ignore that instruction. 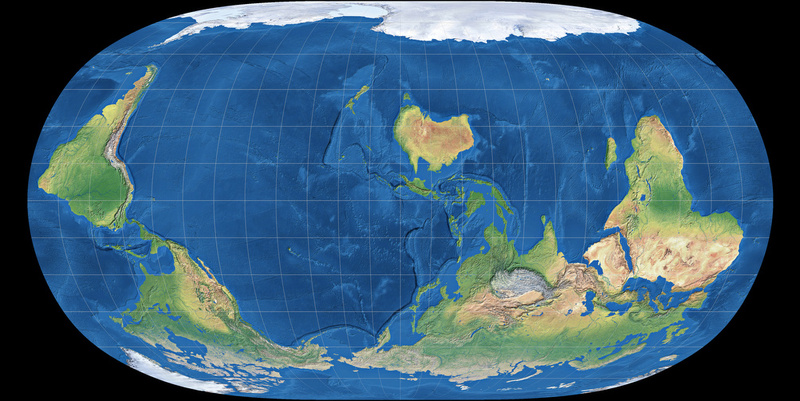 Nonetheless most of you will be able to view the upside-down maps. Most of those maps are cylindrics, i.e. having a rectangular shape. Many of those maps aren’t center to the Greenwich meridian but somewhere in the pacific ocean. I don’t have the slightest idea what might be the reason for #1. For #2 I can merely guess: Maybe most creators of south-up maps come from Australia, and they don’t only want to be on top, but in the (horizontal) center of the map, too. After all, a lot of maps that can be seen here in Germany are centred to 10° East. And I guess that’s not only in order to display Siberia without interruptions… Regarding the educational reasons mentioned above it’s a good idea to occasionally look at maps which are centered to other parts of the world (not to mention that this is quite common in many countries anyway). Unfortunately, I can’t display maps that are centered to a different meridian by simply adding an instruction for the web browser. Instead I’d have to create a whole new set of projection images! I might even do that – some day (but most likely not in the near future). For the time being you have to put up with the two images below, which are aouth-up and centered to the pacific ocean. One of them complies with the usual practice to usw cylindric projections for that, and the other doesn’t. 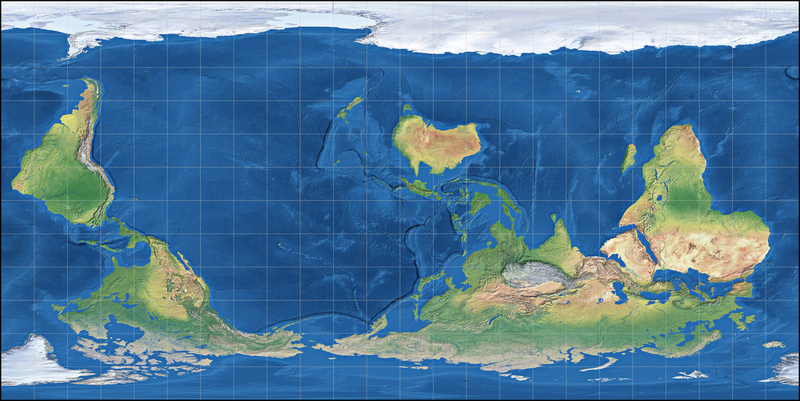 And yes, both image show the world we live in just as good (or bad) as the maps we are used to. Be the first one to write a comment!